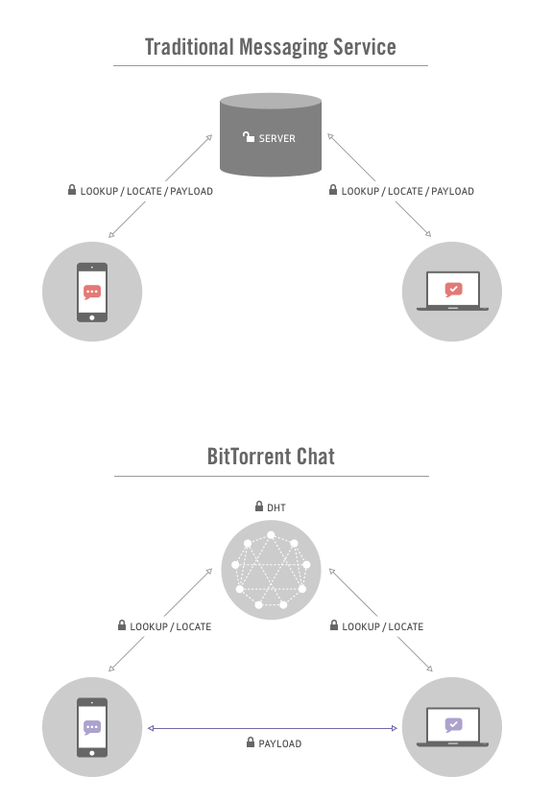 The announcement was short on details, so this seems to be the first look at how BitTorrent Chat will actually work., The company says that since it’s taking a decentralized approach, where your messages don’t go through any of BitTorrent’s servers (as illustrated in the infographic below), the product won’t have any user names. Instead, it will use a process called public-key cryptography. Goldoor also writes that like BitTorrent’s other products, BitTorrent Chat will use a distributed hash table to find IP addresses — which, again, is supposed to allow users find each other without going through a server. For obvious reasons, people may be particularly interested in keeping their messages out of the hands of any company right now, and this isn’t the first privacy-focused product that BitTorrent has launched this year. BitTorrent still isn’t saying when its chat product will actually become available, but you can sign up for the private alpha here.